Looking back on when we were potty training our twins these were the items that we found to be the most helpful. I would highly recommend these to other parents, some we still use even now that they are four. The SnapPower Guidelight can safely and easily transform a regular outlet coverplate into a convenient night light, which automatically turns on in the dark and off during the daytime by a sensor. 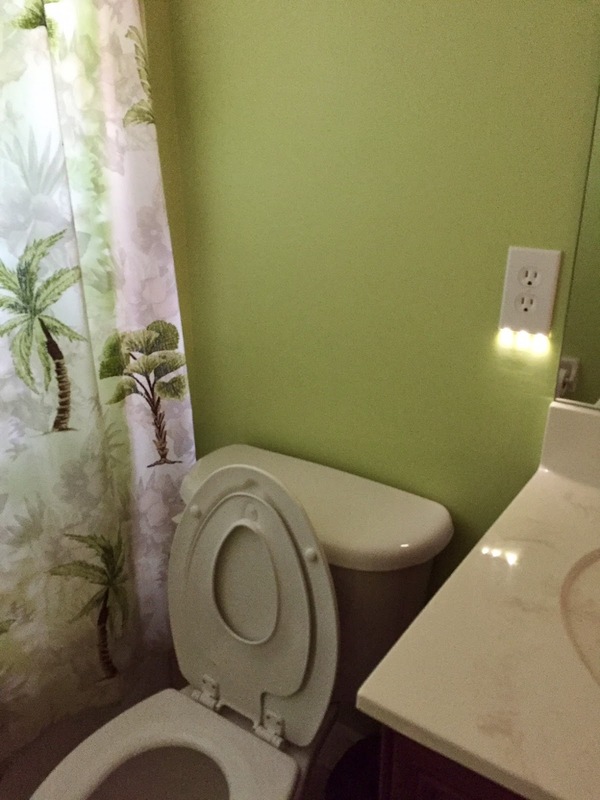 It's equipped with energy-efficient LED lighting for perfect nighttime illumination by a toilet. Installation was as simple as switching out our regular cover plate over an AC outlet. No wiring required! This has been our favorite product since it's helpful even past potty training even as kids get older. I've since ordered one for our guest room bathroom so visitors can find their way at night too. Also, this way you don't have to worry about forgetting to turn off a nightlight switch in the morning, which I was always failed to do. Built-in Potty Seat - Forget the cartoon potty seats! After buying several other seats that my boys would put on wrong, which would then slip off, we went with this built in seat that can be pulled down as easy as a toilet lid. Best of all, it's not bright, bulky or embarrassing to have in your bathroom when guests are over. Potty Stool - We put one of these potty step stools at the base of every toilet in our house. Like above, we still use these stools for by the bathroom sinks now for easy hand washing and brushing teeth. You could also get a squatty potty stool as a twofer. Potty Books - I don't mean books to read while on the bowl, but books that encourage potty learning and explain the process to your little one, so they know all kids make the transition and what the end goal is. We bought three different books, one with Caillou, one with Elmo and a general potty one, all were great. It also helped my boys understand the different terms and vocab we were using too. Portable Potty - The toilet can be intimidating and out of the way when a child has to go and doesn't want to break from playing. For the first couple of months and would move it around the house to wherever our boys were, by the TV, in their playroom, etc. If going on a driving road trip we would even pack it and bring to the hotel with us. We had a different brand that we used at first, but found that this Summer Infant design was the best for keeping boys from spraying outside the bowl. It's also easy to clean, lightweight and nicely designed. It's affordable and available in other colors too.